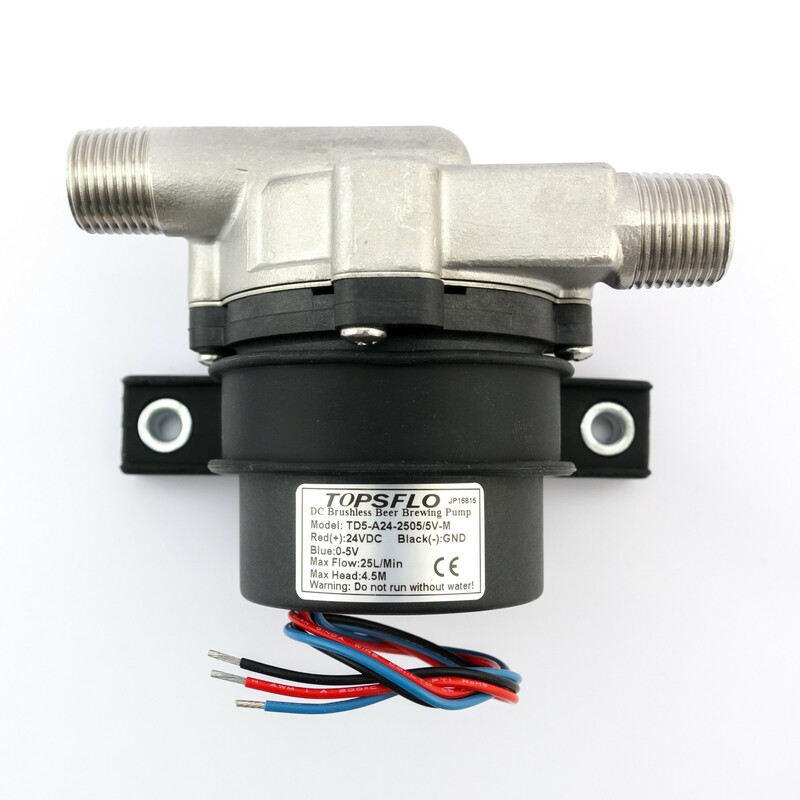 Powerful 24V DC magetically coupled brewing pump with stainless head, speed control and mounting bracket. This product has been replaced by a PWM controlled version. This advanced pump is small enough to be mounted inline, but very powerful. It comes with an electronic speed control board that you can mount in your brewing panel. 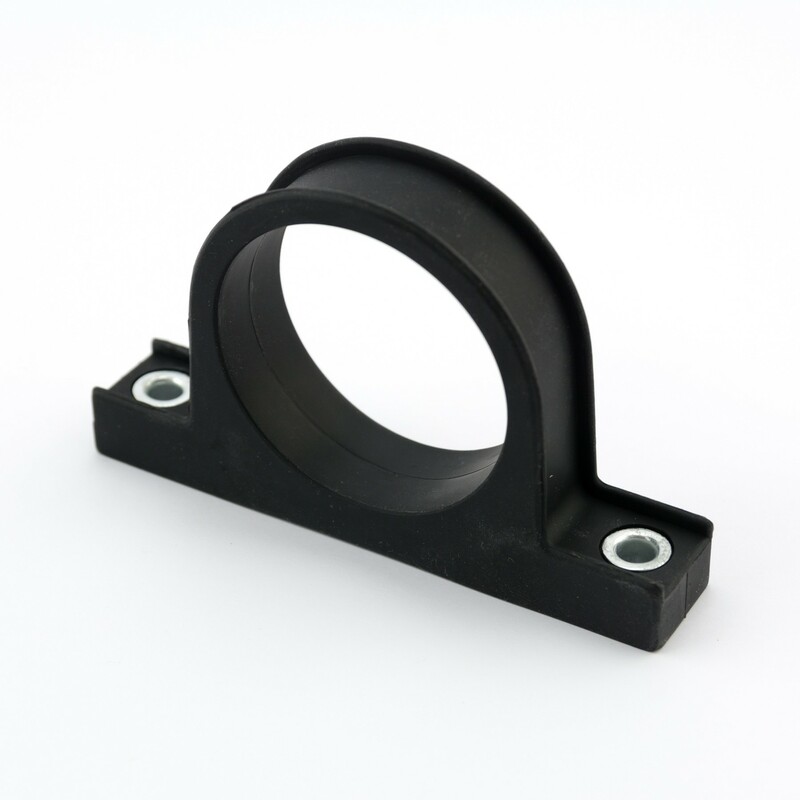 A mounting bracket for the pump is also included. 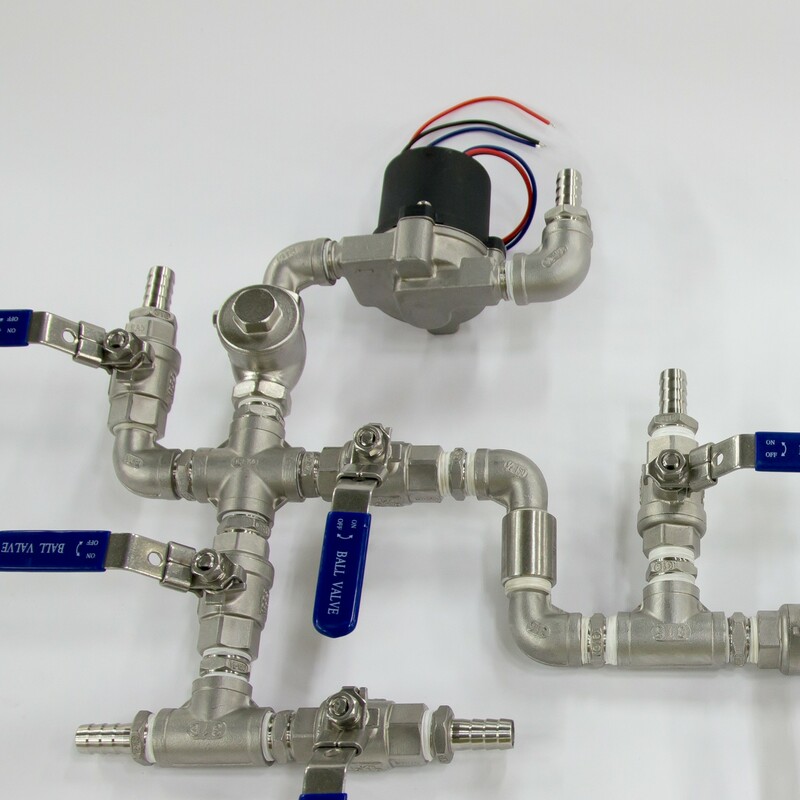 The pump head is food grade stainless steel, with 1/2" threaded fittings that fit both NPT and BSP. 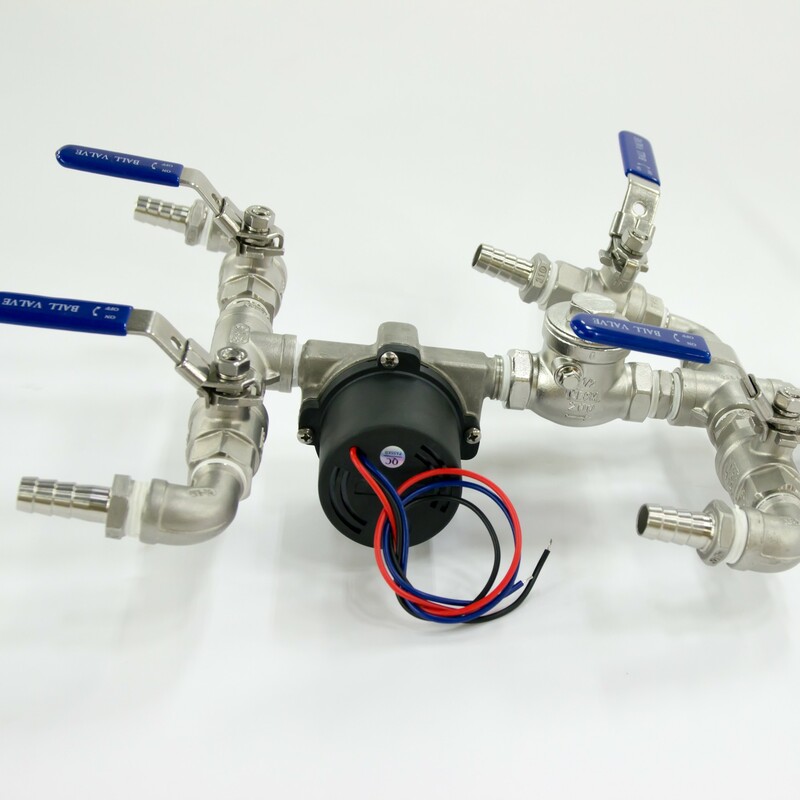 This new model is a complete redesign of the previous TD5 pump, specifically made for brewing. This pump runs on 24V DC and has a maximum flow rate of 25L/min and a 5 meter head. Magnetic drive: the motor shaft is completely isolated from the impeller and magentically coupled for a guaranteed durable seal. 0-5V analog speed control input on the pump. A board to generate this control signal is included. 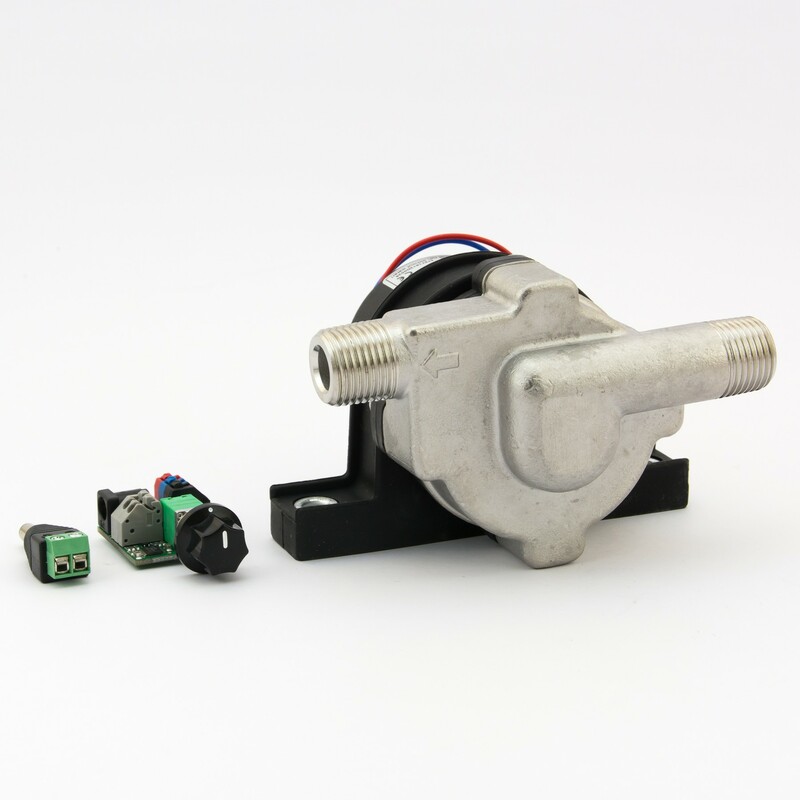 The pump has an internal speed control circuit, which is controlled with a 0-5V analog input signal on the blue wire. We designed a custom control board to generate this signal. You can mount this control board in your brewing panel for easy access, so you can remotely set the speed of the pump. 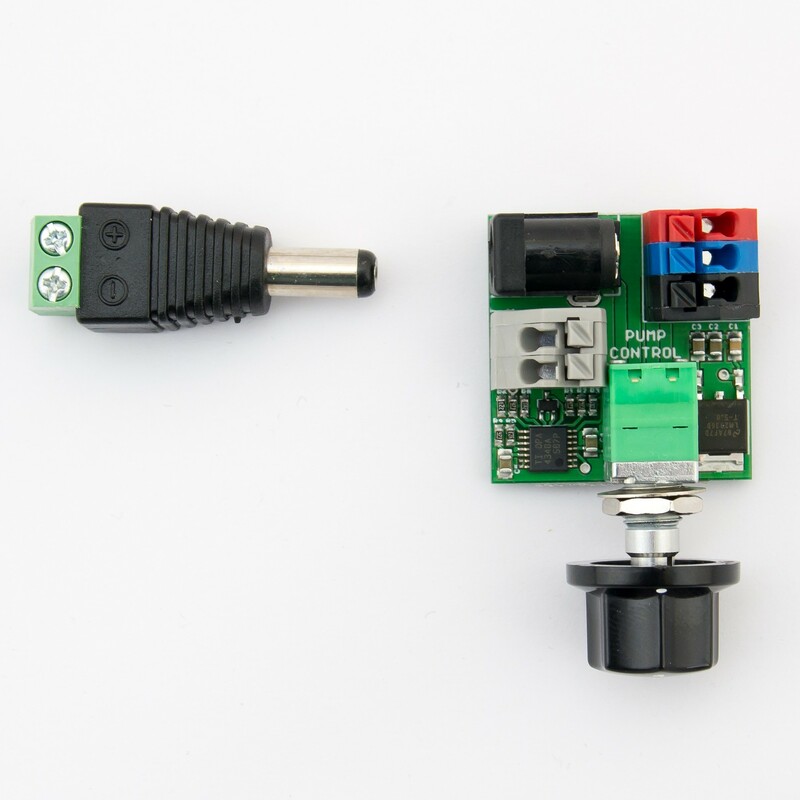 The pump control board has a potentiometer with knob for manually setting the pump speed and a digital PWM input. It will use whichever signal is highest. If you leave the digital input unconnected, the knob just controls the speed. Turn knob fully counter-clockwise untill it clicks: pump switches off completely regardless of digital input signal. Turn knob clockwise just past the click: pump is now enabled and accepts a digital input signal. A power supply is not included, but we do sell various types separately. A screw terminal jack plug is included. Please also see our cables for 3 wire cable to make a longer cable between pump and control board. Yes, 0-5V speed input wire.